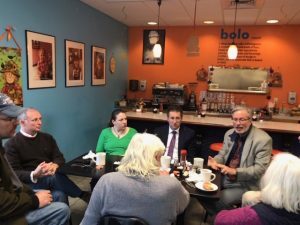 Plainville – Sen. Henri Martin (left, at head of table) and Rep. Bill Petit (at far right) talk with area taxpayers during their Nov. 20 “Coffee and Conversation” event at Bolo Bakery. Martin and Petit, who are currently preparing for the 2019 session of the Connecticut General Assembly, said the regular question and answer sessions with taxpayers help make them better informed lawmakers. Martin can be reached at 800-842-1421 and Petit can be reached at 800-842-1423.